Symptoms: Pretty awesome so far! I like it! Maternity clothes? Looking for cute (longer) maternity tops- mine are just too short! Stretch marks? No... still using the Q10 stretch mark cream from Palmers and every lotion imaginable. Not too itchy yet either! Sleep: Sleeping great and heading to bed way earlier than usual. I was in bed by 8:30 last night ya'll! Still waking up to pee every night 5 times or more so getting an early start helps haha- I know I've mentioned it before but the new flannel sheets are seriously wonderful- I NEVER want to get out of bed! Best moment this week: 24 days until hubs is home and 26 days until we know if baby O is a he or a she! Starting to focus more on potential movement! Movement: Nothing prominent yet! When I lay down at night though there are some interesting things going on ever so lightly so I try to feel for them! Have you started to show yet: ummm yes- no denying I am preggers! Nursery: OH MY GOSH - my father-in-law has FINISHED the nursery. All that is left to be done is the paint color once we determine the gender! Pics to follow! We're thinking navy blue or pale lilly pink! Workouts: Rushing to get a walk in with Emma and bundling up like we live in Alaska- WOW it is c-o-l-d! Only got two in this week so far. Still doing squat routine and weight training on arms. Belly Button in or out? In and stretching.. Happy or Moody most of the time: Happy but getting frustrated easily and exhausted... I'm entitled to some mood swings! Looking forward to: Thanksgiving and a short week next week-Feeling more movement in the next couple of weeks & getting closer to having the hubs back home! Awwww....you look great! So cute! Two things I have in common w/ you (and I don't have the pregnancy excuse): I'm always tired and we always have fruit roll-ups or fruit snacks at our house because I'm obsessed with 4-year-old snacks! Haha. 26 days! Can't wait to find out! Awww yay, you are so stinking cute!!! I love your lil bump updates. Hooray for the husband coming home soon, I'm so excited for you! And to find out the gender! Glad you are getting sleep! If you're looking for longer shirts, I love Gap maternity shirts (they have less rouching and are just longer) and Target maternity tanks and sweaters! And yeah googling anything or looking at pregnancy forums will just scare the crap out of you... haha. I think you can ave lunch meat as long as you heat it up until its steaming. Looking good momma!! Yaaay for the nursery- that is so exciting!! & can I say that your chalkboard skills are awesome & I'm a wee but jealous!? Lol! Yay for your hubs being home soon and finding out the gender! Do you have a guess? You look great and I'm glad you're still feeling good! yum fruit roll ups are my fave! i eat a whole box in one sitting so i don't buy them lol. You look great!! Can't wait to hear if you're having a girl or boy. I ate lunch meat, I did microwave it to heat it to what they said it needed to be, but I ate it. I'm so happy that you're feeling good and not having food aversions!! Fruit Roll-ups I can get behind!! How awesome that you just need to paint the nursery! I have still been eating sandwich meat but I'm. Dry careful... I don't get it if it's been pre-sliced, etc. I'm much more relax about things this time though since it's my 2nd pregnancy. Plus listeria can be on all sorts of things (there was a fruit scare recently) and we obviously can't avoid everything! Glad I JUST finished my sushi with avocado or I would have felt way awkward reading this haha. Can't wait for the gender reveal! Eeekk! You are the cutest pregnant lady I've ever seen! Sounds like you're feeling great, which always is a blessing. I bet you're so ready for the hubby to be home and find out the gender of your sweet little nugget! Can't wait to find out if baby O is a he or she!!! I'm totally team pink! I don't know how you handle the hubs being gone for so long! I would be a mess! And your father-in-law rocks! 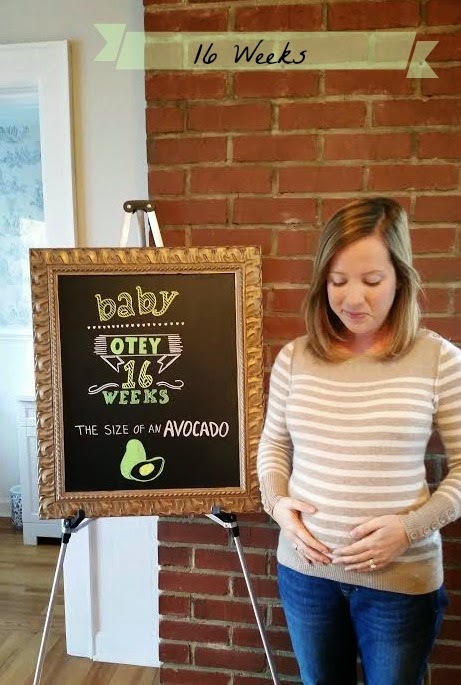 Your bump board is so cute! I could eat fruit roll ups all day long! As adorable as ever! Love reading these each week! You look so great! And, the nursery is almost done? #1 Father-in-law!! Just found your blog - love it!! Oh my gosh! You carry pregnancy so fabulously. You look gorgeous on your maternity clothes and you are certainly glowing in those selfies. Hahaha! Anyway, I love your Q&A, which just showed perfect insights for other first time expecting moms out there. Thank you so much for sharing! Wishing you and your baby the best of health! Take care!